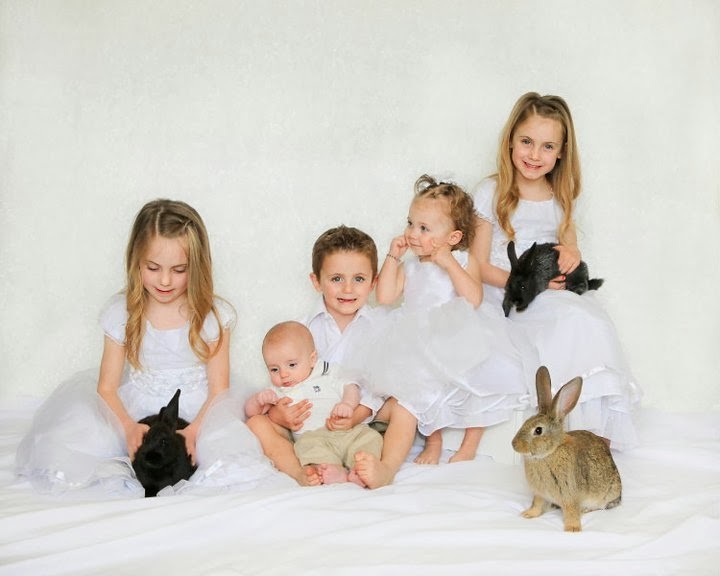 My friend Cheryl offered to take pictures of the kids for me for Easter. I hadn’t taken any photos since Emmett died, so I thought it would be a great idea. 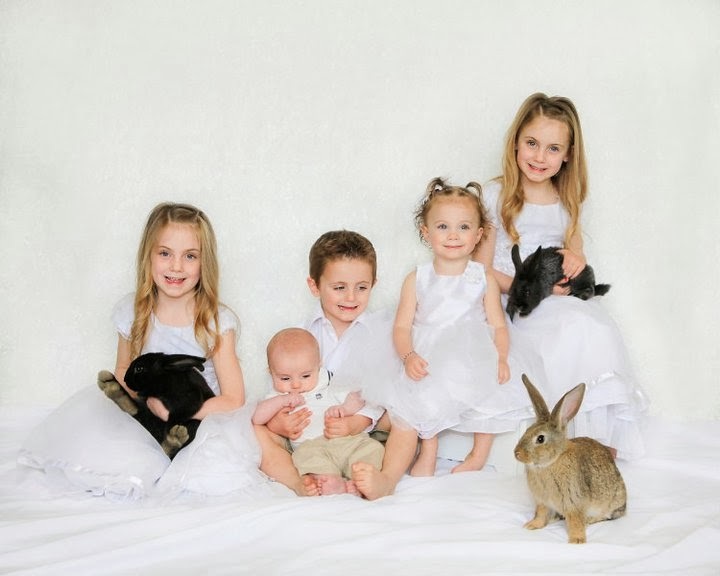 I told the kids they would get to hold bunnies on their laps . . . and they couldn’t have been more excited. As the day of our appointment came, I started to doubt if it was such a good idea. I was still really angry at myself for never having gotten a family portrait taken of us all together after Tytus was born. The only picture of all of us with Tytus was in the hospital. The twins were upset because they wanted to be holding Ty, and it was literally the worst family picture we had ever had taken. I talked about going out and doing some family pictures in the weeks that followed, but we never got around to it before Emmett died. I was so mad at myself. One of my biggest passions in life was capturing moments for other families with my camera . . . but I had failed to capture my own family’s moment. 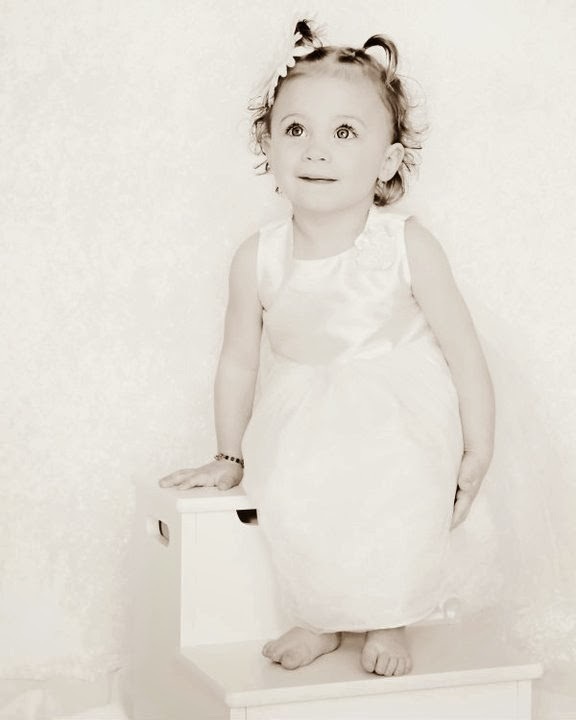 I was nervous all day as I prepared in every way for the kids to be ready and happy for their pictures. Once every one had taken naps, I got them all up and started doing their hair and getting them dressed. My heart hurt. I wasn’t sure I wanted to celebrate any holidays this year . 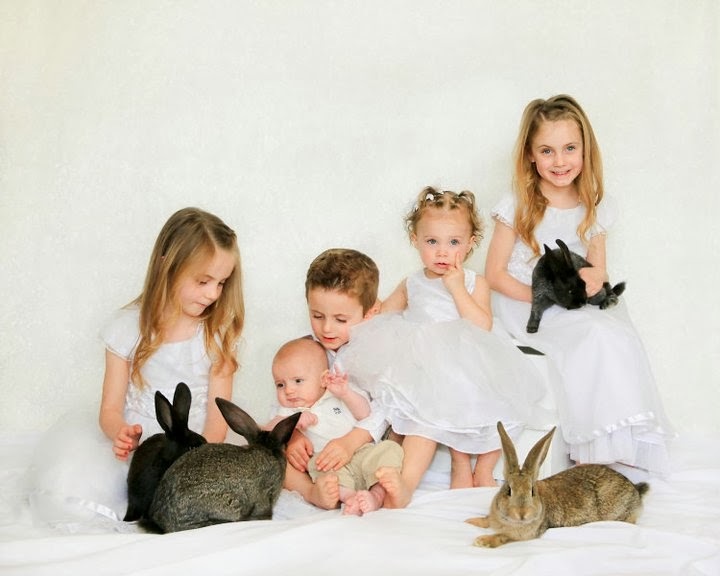 . . and taking Easter pictures of my children without me and Emmett in them seemed so depressing. I didn’t really have a “family” to do a family portrait . . . so it just seemed easier not to take any pictures at all. I got everyone buckled up in the car. As soon as I turned the key . . . panic came over me. How was this happening? I was going to ask my kids to sit in front of a camera and smile . . . when they had nothing to smile about. How could I ask them to smile at me . . . when I didn’t even know if I was physically able to smile back at them? I pressed down on the pedal . . . barely. The drive to Cheryl’s house should have taken about five minutes . . . but that day, it took us nearly twenty. I was overcome by a wave of emotion. I was angry to be a widow. I felt abandoned. I felt alone. I was mad that we didn’t have a complete family portrait to hang on our wall. I was overwhelmed by the fact that holidays weren’t going to take a year off . . . life was going to continue, no matter how much my little mind tried to pretend that it wouldn’t. I couldn’t stop my tears long enough to park and go inside. We passed Cheryl’s house a few times as I tried to talk myself into stopping. Each time we came close to it, I would slow down to pull over . . . but then the tears would start to fall, and I would keep my foot on the accelerator. Finally, I got my tears to stop. I parked the car and unloaded each one of my babies. They looked amazing. 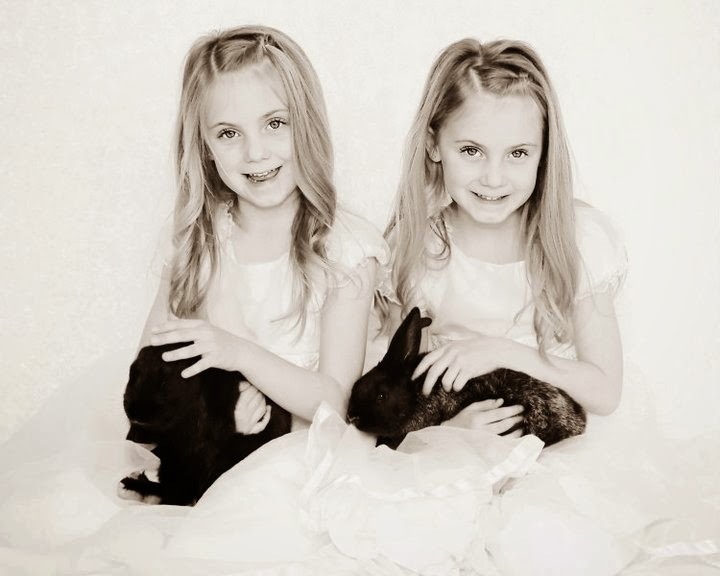 I decided to dress the girls in the white dresses they wore for Emmett’s funeral. At the time, I know everyone thought it strange that I put the kids in white instead of black, but I couldn’t picture my children dressed in black. I needed each of them to be a light for me . . . and everyone else who saw them that day. They walked hand-in-hand to the door. My tears wanted so badly to keep coming, but I gulped them down. The front door opened. We walked in, and the kids sat down to take off their shoes. They were a bit nervous . . . like me, they probably also wondered if they had it in them to smile. 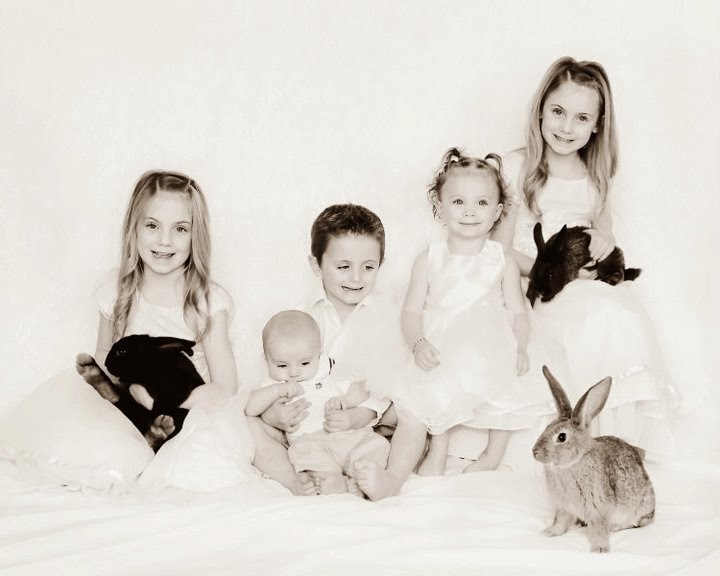 We got them all situated in front of the backdrop and began placing bunnies on their laps. For the first time since their dad had died, I saw light in their eyes. They were so excited to see these new little bunnies . . . animals so full of youth and life. 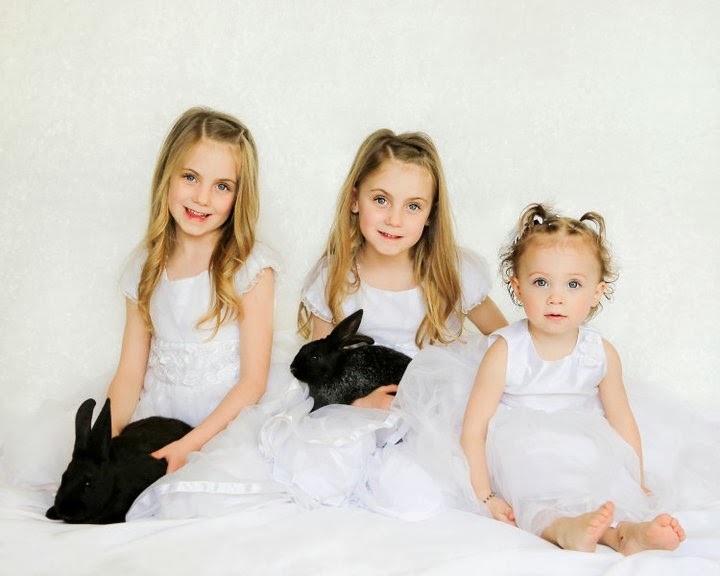 It was as if the bunnies were bringing a little sparkle into my children’s empty souls. I felt tears began to fall as I watched my kids re-discover their smiles. They looked out, each set of blue eyes staring straight at me. I was the only one watching. I was the only one they had to look to. I saw hope in their eyes . . . and it was all directed at ME. I had to figure out how to be the best me I could be . . . because now, I was the only one they had to smile for. I thought about Easter. What did it mean to me now? I knew it applied to Emmett . . . he needed Christ to save his soul. I saw how it could help Kandi . . . she had so many things for which she needed to repent, that it made me want to scream. I knew that Rob would need the Atonement to find forgiveness for pulling that trigger and killing my husband. But I was the victim . . . why did I need the Atonement? What was Easter going to do for me? From every Easter lesson I had ever heard, the main thing I remembered was that it was for the sinners of the world. Christ had suffered to take away THEIR sins. I wasn’t a widow because of my sins. I knew exactly why I was here . . . and it was because of the sins committed by others. Christ’s sacrifice on the cross wasn’t for me, right? Or was it? 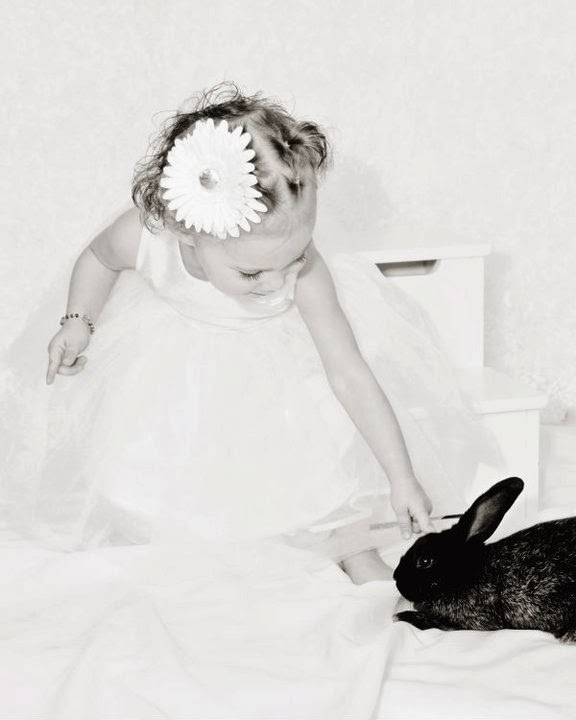 As I watched my babies play with bunnies and giggle as they squirmed . . . I thought about Christ’s promise. He died so that we could all live again. Live with Him. Live with eternal happiness. Live eternally. These smiles for which my children had been searching . . . could last forever? Yes! They could have eternal happiness . . . because the Savior died—even for them! He knew they would go through pain. He knew that at some point in their lives, they would lose the glimmer of hope in their eyes, and they would forget how to smile. So He suffered in Gethsemane and hung on the cross for THEM. So that the wounds that had stolen their childhood could be healed. He died so they could smile . . . eternally. They were the victims. They were the ones who suffered. Rob didn’t suffer to help them heal. 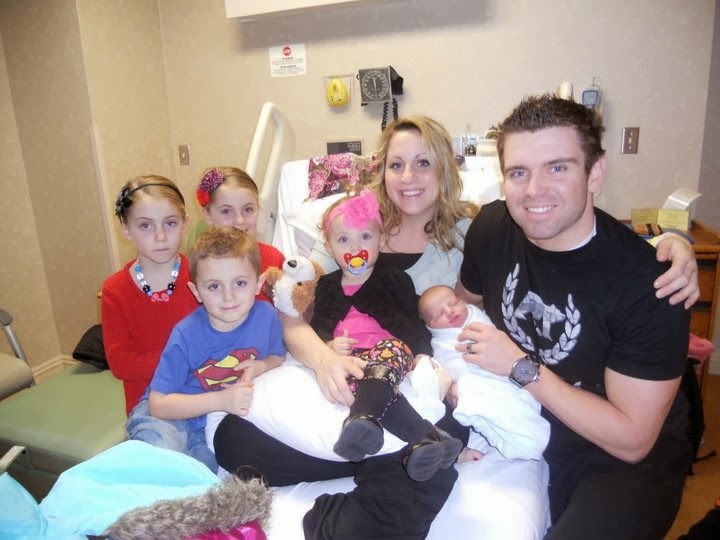 Kandi and Emmett didn’t go through pain so my children could one day feel whole again . . . but Christ did. And He did it willingly because He loves us. He agreed to take upon Himself, not only the sinner’s pain of regret and remorse, but also the pain suffered by the victims, who were yearning for peace. All of the sudden, my tears were no longer about the moments I had lost. They were not about the family I no longer had. The tears that filled my eyes as I watched my little ones smile . . . were tears of joy for all that I did have. I had a Savior who not only righted my wrongs when I needed Him to, but who died for me so that I could one day live with Him again. I had a family. I was staring right at them. There were ten tiny hands that needed me to hold them. There were ten big, blue eyes watching me to learn how to keep on living. There were five little hearts beating to inspire my own failing heart. Yes, I had been wronged. Many things were taken from me on the day those bullets were fired . . . but my family wasn’t destroyed. My children still needed me . . . and even more than that . . . I needed them. I had a family! And they were perfect. When the little babies started getting restless, Cheryl asked me to jump in for a shot. I hesitated for a moment. My pride told me that a photo of me in tears next to my beautiful children wouldn’t look good. Then I thought of the picture we had never taken with Emmett, and I grabbed my babies in my arms, and red eyes and all, I smiled for all the blessings that surrounded me at that moment. I smiled for my Savior who died for me on the cross so that I could smile forever. 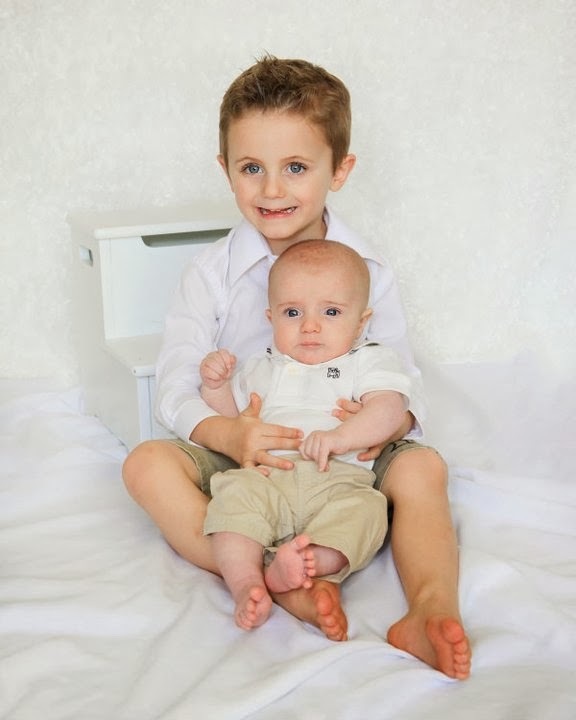 I beamed because I was blessed to be the mother of these perfect little spirits who shared my difficult challenge. Yes, we were the victims . . . but we were smiling. Easter is a holiday of hope. It is about the love we have for our Savior, who in turns shows us that His love is eternal . . . and His sacrifice is for us. I did believe in Easter. I knew the Atonement was real and that I needed its power. For the first time, I saw my children for what they were . . . my family. They were all I had . . . and I needed to accept this fact and show them that I could do this with them by my side. I was all they were smiling for now . . . so I needed to figure out how to be the best, most healthy, me I could be. As we snuggled the bunnies and thought about the true meaning of Easter, I couldn’t help but wonder how the Atonement works after we die. What did it still mean for Emmett? I wanted to know that even he could find a way to use the power of the Atonement to heal his soul, because I knew that as he healed . . . these children would find peace too. We all needed the sacrifice that Christ had made for us. We needed to find peace. We yearned to become whole again. Jesus didn’t just suffer and die for Emmett, Kandi and Rob . . . He died for me as well. He died to help heal my soul. He died so that when I make mistakes, I can be forgiven. The Atonement is real and it is not just for when we sin, but also for when we need to forgive. His power to heal is for all of us. Regardless of what Rob did, regardless of the choices Emmett made before his death, I had a job to do . . . right now, for ME. ‘Capturing the moment’ is not always done with a camera . . . it’s also living and breathing in the moments we stand . . . the moments we’ve been given here on earth. It’s finding joy right where we are in life, and not waiting for tomorrow to bring us the happiness we seek. We must capture the moments when we stand! We can’t let them pass us by. We must capture them in our minds . . . capture them in ours hearts and capture them with the ones we love. We must feel with every fiber . . . the moments we are living right now. We must believe in our hearts that Christ not only died for us in our sins . . . but that He also died to heal us in the moments when others’ sins have shattered us. I didn’t get the family picture I always wanted, but I was blessed with the ability to picture the life I had right now and cherish the blessings all around me. Christ had not forgotten about me. He had not given up on my family. He was proud of us and wanted me to be proud of the family I was raising. We weren’t broken . . . because He would heal us. We were a family . . . just the way we were. The Atonement is not just for someone who has sinned . . . it is for all the victims—young or old—who are smiling through their pain, all the souls who feel abandoned and unlovable. It is for every single one of us to capture in our hearts and hold onto forever. Even in moments when we have turned away from Him, or we cannot see how His sacrifice applies to us, He is still there to take upon Himself our pain. That day, I smiled for every hope I had in the Atonement, which I needed now more than ever before. The Atonement was for ME. Easter had meaning . . . and it meant that one day, I would feel whole again. And in that moment, I knew that Christ sees us as being everything He ever wanted us to be. He had taken our pain upon Himself, and only He can provide the light to make us whole again. I, like many others, read your blog as soon as posts pop up, but never comment. I just want to say that you are inspirational and your testimony has strengthened mine and I'm sure thousands more. Thank you! Bless you, you dear sweet woman! I remember your kids wearing white to the funeral-and I thought it was perfect. It reminded me of eternal families and it was like a little piece of heaven was there that day. That was beautiful. You have a beautiful family. Thank you for sharing. Ashlee thank you for this post. I don't think I ever thought of the atonement this way until reading this. I am the mother of little children and I worry so much about sending them into the world where they can potentially experience pain. Your post helped remind me that Heavenly Father thought of that long before I did and provided a way to heal, and that that process is why we are here, to come closer to Christ and try to be like him. I am so grateful for your posts and your strength to endure. Thank you. Those photos are beautiful because they're genuine. I think it's important to capture moments in life both happy and sad. You choosing to be in that photo shows that you were THERE. It would have been understandable for you to be unable to get out of bed, to give up, to be defeated. That photo shows that you got up, you took care of those sweet babies the best that you could and fought to not let a terrible tragedy stop your family from living and celebrating your lives. That had to have taken major strength. It would have been easy and understandable to ignore the pain, to not think about the meaning of Easter- but look what you & God's love transformed your pain into. And even now, though you've suffered so much heartache, you are comforting others, including those you haven't met with your words and testimony. You might have been a victim, but those who've wronged you have also victimized themselves. While you are choosing to rise above it, they have to live with themselves and what they've done. They will not be free of it until they've repented and asked for forgiveness, which it seems they have not done. This is beautiful. I don't mean this to be offensive but I see you and your children as survivors. Surviving a horrific crime that should have never happened. Thank you for sharing. Lovely pictures and very encouraging words. Many blessings and hugs to you Ashlee! Your children have an amazing mommy! Thank you for your blog! My husband knew emitt when he went to ricks college. I started reading your blog and told my husband and he put the pieces together remembering his story. I love your strength and dedication to your kids! You are an angel on this earth for them. They need you more than ever and you are amazing! We also have 5 little kids, with a 5 week old baby. I feel so many emotions for you as a mother. You inspire me. Keep going, girl! Your attitude will take you far. Thanks for sharing! I'm so glad you jumped in the picture with your kids. You will be too over the years:) thanks again. Thank you for sharing such a strong testimony. It's so hard to be human, and your words remind me of the resource and strength that God is for us and the sure love of out Savior. Your life lessons have come at such a high price. I am so sorry. You are able to share such wisdom and light! Thank you for being strong and sharing that strength with not only your little ones but with us. You are a strong voice filled with light. I'm grateful for you. Thank you for sharing your testimony and experiences. At first I kept thinking why share this, judging like an idiot. But after taking the time to read and think, I'm grateful you have share this. There's many in this world who are going through experiences like yours or through other trials and your message can help heal and helped them not loose faith in our Father in Heaven and a Jesus atonement. Thank you for being brave and taking the time to share your thoughts and feelings . You have a beautiful family and wish you all the happiness in this world. Thank you again and sorry for being negative at first. This was a mind opening experience reading your blog. Thx again . What a great post and pictures Ashlee. The Atonement is so real and I know that Christ lived and died for each and everyone of his children. You are an inspiration to many. I truly enjoy reading your blog posts. I just found your blog today, via KTVB. As I have been reading your story, sometimes through tears, I am struck by your unwavering faith and dedication to God. My heart has hurt for you and your children over the last few years every time your story is run through the media again. I don't know how you managed to feel and deal with the whole range of emotions that no one else can possibly imagine. I am so sorry for your loss, and I pray that peace covers you and your children every day. May God bless and keep you all. Such beautiful pictures, you are so strong! I pray you inspire others with your story. I seriously can't stop reading your blog. Everytime I think I can't handle my kids or am sad about something, you just make me realize how much I have and how grateful I am and who have me all my blessings. Your testimony is so incredibly beautiful! I'm so glad you are sharing it with us. I really wish the best for you and your family. Your kids are beautiful!! I watch the story on Dateline I've seen the excerpts of dr. Phil I need to forgive someone how can I have so much rage. I want her dead . Those are real wishes and it's so scary but this behavior is always suffocating me and not her. No contact with her I tried to reach out ugly text and voicemails. That that only helps me feel better for a few minutes. I was lucky enough to Save my marriage and we are we're happy but we have a lot of problems right now financially and I had health problems so things are not that great in my life right now. 2018 beginning in May I lost my job, my mom, found out about an affair, and diagnosed with breast cancer, all within a 6 month period. Counselor said most people never go through in a lifetime what I've gone through in 6 months. Which not much money for counseling an insurance I'm trying to heal myself. I've been watching your videos and they are so inspiring because what you went through. Its's bad or worse than what I've gone through but i am broken.. I Cant fix me, n n nothing is helping. Can you help me?